Hey everyone! I’m back with another excerpt! This one is from my upcoming release Heart of a Prince! It comes out July 31! YAY! You can still get it for the discounted price of 2.99 until the release date :). I love this story – I love Jordan and Astrid and I’m loving delving into a new series! It does connect with my previous books, but comes earlier in continuity than Reclaiming Hearts (we’ll catch up to them in the timeline in… book 4 I think – we’ll see some of what we didn’t know was happening in the Eyjanian royal family, etc. before we get to the Reclaiming Hearts portion of the timeline). So here’s the beginning of Chapter 1! I can’t wait for y’all to get to know Astrid and Jordan too! Jordan Haines gripped the bar and leaned his weight backwards. The wind shifted, again, and he found himself windsurfing toward an unfamiliar beach in a sheltered cove. Posted signs warned that this was a private area, but Jordan ignored them. He knew himself. He knew his body. And he was about at the end of his sometimes frustratingly short endurance. The time had come to get off the ocean and onto the beach for a rest, until he could call someone to pick him up or get enough of his oomph back to get back out on the waves. The former was more likely, but the latter was his preference. He’d packed some energy bars, just in case. A few minutes after ignoring the signs, he sat on the beach, his gear dismantled for the time being. Under a conveniently placed umbrella, Jordan opened his pack to remove the protein bars and water bottles with energy drink flavoring. Jordan sat there, mesmerized as the waves moved in then out then in again. He loved the ocean, always had. More and more in the last two years, something about the clear blue salt water called to him like a beacon. He turned to see a woman walking onto the beach from a staircase a short distance away. Jordan lifted a hand in a friendly wave. She came closer with each step. Slender, with wavy golden-brown hair, a gorgeous accent, and an attitude. This could be fun. Unless she had him arrested for being on private property. Jordan held up both hands in mock surrender. “The wind got a bit out of control, and I needed a break before I could go any further. I promise I’ll be out of your hair soon.” One way or another, he would be. Up close, he realized everything about her screamed money. That shouldn’t be a surprise, not given her presence on a private stretch of sand. Manicured nails. Jewelry that dazzled. Way too fancy for a day at the beach. “Are you really planning to spend the whole day on the beach with nothing but whatever you’ve got in that basket?” He reached over and peeked inside. A book. A tablet. Food. Water. She didn’t reply but continued to stare at the waves. “If you want to talk about it, I’m a great listener.” What made him say that? Did he really care what this woman had been through? Something deep inside told him that, yes, he did care. Far more than he should. Jordan hesitated. “You don’t always have a choice. Sometimes it just happens. Don’t ask how I know.” He took a big swig of water. He couldn’t let his thoughts go there. There you have it! They’re off to a… start anyway ;). 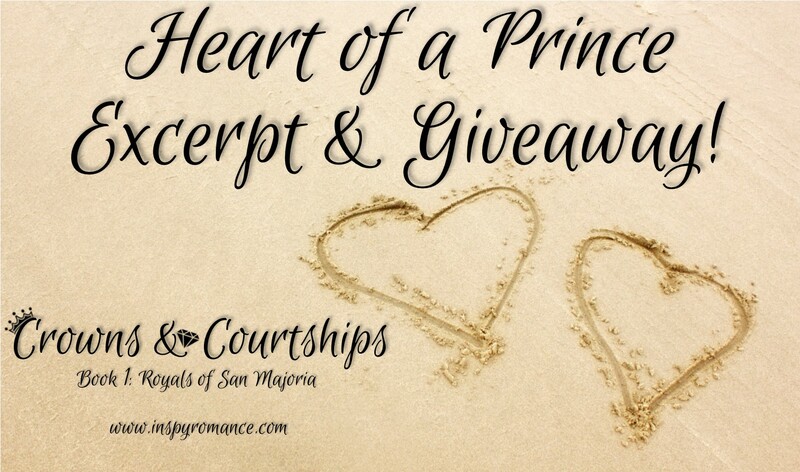 Maybe not a great one, but they’re both intrigued by the other :D. In the comments, let me know your favorite summer beach read for a chance to win an ecopy of Heart of a Prince! You can preorder here if you haven’t alreaedy! Carol, have you read Cannilyn Cosette’s series? Beautiful! Can’t wait to get my hands another one of your books, I have enjoyed them all! Hi Paula! Thank you! I hope you enjoy this one too! I just read the first book in this series and it was fantastic. Looking forward to reading this one! I’m so glad to hear that! I hope you enjoy this one as well! Congratulations on your upcoming release, Carol! I loved the excerpt! Hi Carol! Your next release is preordered and looking forward to another royal romance. My favorite summer reads are two series: Arcadia Valley and Beach Brides. Enjoying the new series concept were authors get together to write books with a common theme. Beach Brides is a about twelve book club friends, who went on vacation and tossed a message in a bottle to sea. Just how the authors in Arcadia Valley all approach the food theme differently, so the bottle is approached differently. Also enjoyed reading boxed sets Cherish and Picnics and Promises. Definitely no lack of good reading material and promotions from authors. I have 9 books on preorder. Just hope my aging eyes can keep up with all the reading. Enjoy your summer. That’s fantastic! Sounds like you’ve got a great bunch all lined up! This sounds like a great read! I can’t wait! Hi, Jenny! Me either! Though I’m sure I’ll be biting my nails the day it comes out ;). Huzzah, forgot this was awaiting me this month. Happy surprise! I hope you enjoy it! Thanks for the exerpt. I loved the story, can’t wait to read it!!! Hi Laura! I’m glad you enjoyed it! I don’t think I’ve read any of your books. This one sounds like a great place to start. Thanks for the teaser. I’m waiting not-so-patiently for this to magically appear on my kindle – thankful for the ability to pre-order! I enjoy how you interweave your characters through the different stories and hope to get an update on Dare and Betsy!! Hi, Julianne! 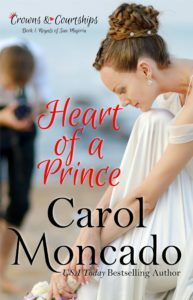 This one actually jumps back in time to that period between the end of HAND-ME-DOWN PRINCESS and the beginning of WINNING THE QUEEN’S HEART (in fact, we get a slightly different perspective on the wedding that takes place in that book ;)). And Dare and Betsy are definitely around! Thanks Diana! I hope you enjoy it! You know I just love all your books Carol. :) I have pre-ordered this one and have been reading ones I have that I hadn’t read yet. Just finished Reclaiming Hearts recently and can’t wait to get more of the backstory. Hi, Andrea! I’m so glad to hear that!!!! AH! I love William and Maggie! We will find out what’s going on with Isaiah and Benjamin, etc. This book goes back about 18 mos or so to July 2016 (RH ends early 2018). Benjamin’s story (which I’ve started writing and LOVE) picks up the night he leaves the Mevendian Ball, but this book and the next two will tell us a lot more about what was going on in the background to get to that point with Isaiah and Benjamin. And it’s all fallen into place SO WELL… almost like it’s a God thing ;). Looking forward for the book. Great exerpt. Hi Priscila! Hope you enjoy it! My current pool read is Business Boutique by Christy Wright. I love to go sit by the pool in my neighborhood and soak in the sun while reading a couple of chapters. I love our local aquatic center! In fact, I’ve got two books there so far ;). I haven’t spent nearly as much time there this year as I wish, but maybe next year will be better – or the rest of this one ;). I always love your stories and they would be one of my favorite beach reads. Sounds like a fantastic read. And wow, the cover is beautiful! Thanks, Jackie! I kind of love it! I went through several others (that I also really like and may use some other time but they didn’t fit THIS story) but this one is just perfect! Hey everyone! Hope your days are going well! I’m band momming it up this week! And I’ve been asked to be in charge of some of it which I hadn’t expected. That means today’s super busy, but I’ll be back later to respond individually! So glad you’re here! Off to feed band kids popsicles! This one looks very good! Intriguing. I don’t have a fav beach read. Just a long list of books on my TBR pile! I’m with you! And it’s growing by the day! So many books so little time! This is a very interesting start to a story, I want to read more. I’ll tell you a secret… ;) This is actually the beginning of Ch. 1. There’s a prologue that comes first, but I’m keeping it back for the book :D. And you’ll find out why this particular day is the worst of Sofia’s life ;). Love the excerpt! HOAP has been preordered since forever, and I’m looking forward to having time to read it. By the time it comes out I’ll be over a few major hurdles, and I’ll be able to relax and enjoy the San Majorian sun. What am I reading? I’m wishing for non-guilty reading time with Christian contemporary fiction, though I’d take more of Tessa Afshar’s Biblical historical fiction if I had time, too. I’ve read all of your books (mostly binge-read when I discovered them, while recovering from bad surgery complications) so I’m glad to quell my impatience by being busy this month, LOL! Oooh, let me know what you think of Tessa’s books. Which one showed up? Tessa’s a good friend and a good storyteller. I have favorites, of course.. ;-) Hope you have time to read! Meanwhile, I can’t wait to read YOURS! Favorite summer beach read is whatever book I happen to be reading at the time. I did recently read a novella collection called “Finding Love at the Oregon Coast” by Angela Ruth Strong, Christina Coryell, Heather Woodhaven, and Lisa Philips. I had to pick it up since each story took place in towns on the Oregon coast I’ve lived in. :-) Fun read! Hehe! I totally understand that! That sounds like a fun book! Especially if you lived there! Thanks for the excerpt. I pre-ordered this bk back when it first became available. Can’t wait until the bk comes out. I’m grateful Kindle has a screen reader since I love your books but none of the places I get audio from, including the Library of Congress for the Blind & Physically Handicapped among others, have them. (They reallyneed to catch up!) You mentioned Biblical stories. I wondered if you like those by Bodie and Brock Thoene? looks like a wonderful book to read, no matter where you are. I love the cover. Sounds like a great book. Thanks for sharing it with us.